3: Although rhetoric possesses important patterns that have been mapped over time, the quality of the polemical genre must also be assessed according to the historical conjunction. Polemics that are poor copies of previous polemics, that try to place themselves in the formal patterns of Lenin or Mao decades after this style has been transformed, often stretch the form so that it's obvious they are attempting to base their strength merely on the style of strong polemics used in the past rather than the content. Plagiarism within a genre is always unfortunate; poor polemics engage in such plagiarism. The rhetorical form must be immediate for a polemic to manner. Hence, the style of Lenin's polemics were different from the styles of Marx and Engels. The rhetoric in Mao's polemics was also formally distinct. 4: But rhetoric is not enough. The polemic as a genre is not merely an exercise in rhetorical posturing. Functioning primarily to demarcate the polemic will fail to make clear and strong delineations if it cannot also make strong arguments. That is, the genre's requirement for excellence is the merger of the rhetorical with the logical. The greatest polemics did not content themselves merely with insulting their objects of criticism, nor did they lose themselves in speechifying and quote-mongering. They understood what they were subjecting to criticism, they engaged with it thoroughly and rationally. They marked out a counter-position and forced the reader to consider its truth value through the combination of rhetoric with logic. 5: The rhetorical-logical form of the polemic, however, is only meaningful in regards to its content. The polemic is successful as a polemic insofar as it is capable of pushing political substance, and the logic required to accept this political substance, through the affectation of an immediate rhetoric. Only by merging the immediate rhetorical tone with both rational depth and political substance can a polemic truly succeed in its function of political demarcation and mobilization. 6: Failure to apprehend the genre leads to a failure in the polemic. 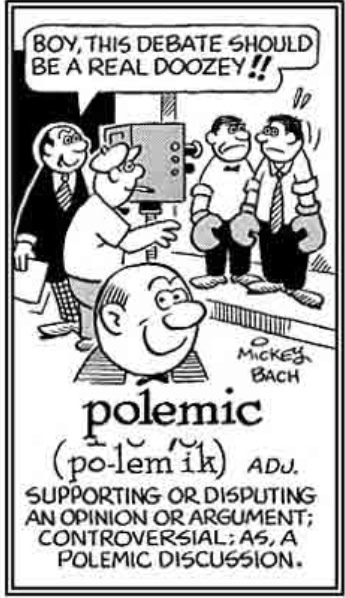 A polemic's weakness can be charted according to the following registers: i) weakness in rhetoric; ii) weakness in rational engagement; iii) weakness in content. Apprehending these weaknesses is difficult in the moment, especially for the would-be polemicist and their political milieu, because it is always the authors and those circulating around the authors who imagine that they are writing like another Lenin when in fact they may be writing like a contemporary Kautsky. 7: The polemic is a strange genre because on the surface it seems simple to master when in fact this is far from the case. Rhetoric is easy, rational argumentation more difficult, and the deployment of the rhetorical-logical form so as to generate significant political substance the hardest skill to master. The would-be polemicist forgets that Lenin went back to Hegel's Logic before writing State and Revolution. 8: Contemporary would-be polemicists tend to be enamoured by the rhetorical form, which of course can be intoxicating, and thus write only on this level. Even worse, they adopt the speech patterns of previous polemics, dogmatically replicating old forms, and lean on vulgar repetition and quote-mongering at the expense of creative rhetoric, insightful argumentation, and the generation of political content. Although it is the case that various social media technologies have contributed to such a degeneration of the genre (the impoverished style of argumentation on Facebook or Twitter is translated into a so-called "polemic") this has been a long-standing problem with polemics. 9: The fact that a significant portion of the New Communist Movement are now under the impression that the genre of the polemic is worthless is because they witnessed its hollowing out at the end of that political sequence. There was indeed the fact that multiple NCM groups became invested only in the rhetoric and not the content, that their obsession with form over content prevented them from discovering unity because rhetorical exchange cosmetically widened the gap between points of substantial unity. The real problem, though, was not the polemic as a genre but the impoverished use of this genre. The rhetorical aspect of the genre became predominant, overdetermining political content, so that the genre's possible strength was lost in a cosmetic sectarianism. 10: But we must remember that the best polemics transcend their historical circumstances. They can only do so if the registers of rhetoric, logic, and content are unified according to the language and style of the current conjuncture. The polemic remains a literary weapon for a revolutionary movement but only if it can accomplish this unity in such a manner. Otherwise it is doomed to remain empty rhetoric, a repetition of old patterns. 11: The polemic is necessary. And yet attempts to polemicize that fail to appreciate the difficulties of the genre undermine this necessity. The polemic is thus simultaneously necessary and unnecessary. In order to grant the importance of the former we must reject its latter articulation. The polemic must be renewed against its empty rhetorical mobilization.